Adams County, CO – On Thursday, September 20, 2018 Adams County Sheriff Michael McIntosh and members of the Adams County Sheriff’s Office will participate in a playground build. Unison Housing Partners (formerly Adams County Housing Authority) will be preparing and installing a playground at Creekside Apartments. 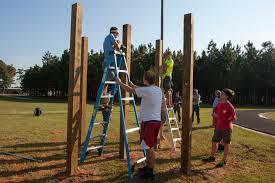 This is definitely more than just putting in the physical labor to make a playground,” said Sheriff Michael McIntosh. “This is a chance for our Agency to not only work hand in hand with our great partners and volunteers that make up our community, but also build a structure that allows families to get together and meet face to face. I couldn’t be happier to be a part of bringing families together. When: Building starts at 8:30 a.m. and the Ribbon Cutting will start at 2:30 p.m.